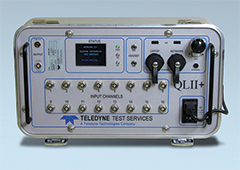 Teledyne Test Services’ QL II+, together with a laptop computer, is a two-box system used to test both air-operated and motor-operated valves. It captures data from Teledyne QSS and SMARTSTEM sensors as well as any other strain-gage or voltage-based transducers. The Teledyne sensors provide continuous direct torque and thrust data from the stems of valves undergoing diagnostic testing. QL II+ collects data at rates up to 10K samples/sec and allows the user to view up to 16 channels of valve test data simultaneously on the laptop computer display. The QL II+ system has 10 input ranges, from +/- 20 mv to +/- 10.24 V. The software has enhanced triggering functions; setup, test, and replay options; trace marking and annotation capability, real-time viewing of channel data and automated report generation. The QUIKLOOK 3 software is integrated with Microsoft Access for full database manipulation of marker data and full trending capabilities. Data from different tests can be synchronized to a common marker. QUIKLOOK 3 software also has a sentry mode for unattended valve monitoring.